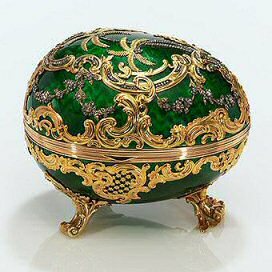 The 1902 Kelch Rocaille Egg is made of varicolored gold, platinum, rose cut diamonds, translucent green enamel and silk lining. The heart surprise is made of gold, rose-cut diamonds, rose and white enamel. 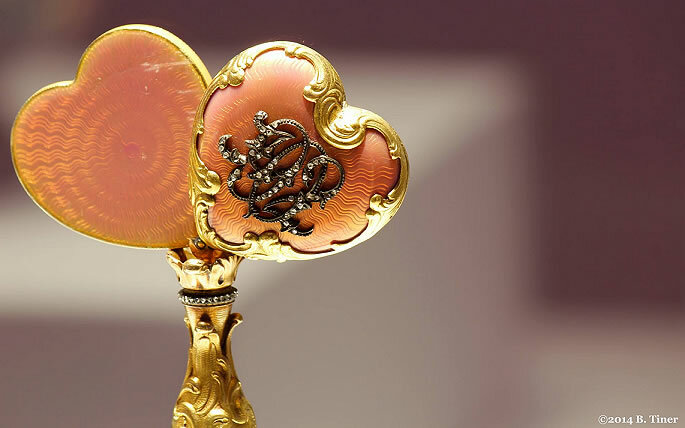 Supported on its side by three scrolled feet, this gold rocaille Egg is adorned with gold rococo cartouches, platinum flowers set with diamonds and varicolored gold palms, also set with diamonds. 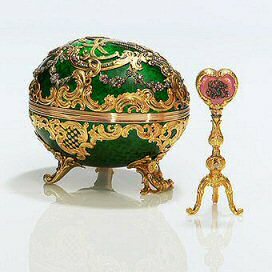 Within the Egg a gold tripod is surmounted by an engraved heart enameled translucent rose showing on one side the diamond set initials B.K. (Barbara Kelch) and on the other side the year "1902" The miniatures originally contained in the three frames are now missing. The Rocaille Egg was not seen publicly for more dan 30 years. It was offered for sale in London in june 1995 but did not sell. 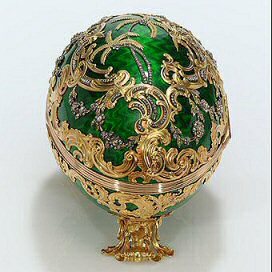 The surprise of this Egg is very similar to the pedestal with miniatures which may have been the surprise for the missing 1897 Mauve Egg with miniatures, made for the Dowager Empress, Maria Feodorovna. 1920 One of the six Eggs sold by Morgan to A La Vieille Russie, Paris. 1940's sold by A La Vieille Russie, New York. 1949-1958 owned by Jack & Belle Linsky, New York. 1958 bought by A La Vieille Russie, New York. 1962-1997 Private Collection United States. 1997 private sale arranged by dealer Proler of Dallas to a US buyer. 2012 Bought by Artie and Dorothy McFerrin for their collection. Update Oktober 2016. 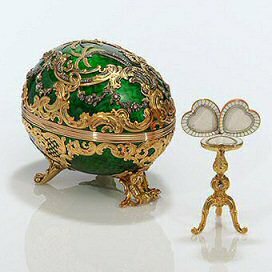 The marvelous photo of the miniature of the Egg, I found on Pinterest on the Internet. Problem with Pinterest is that the original poster often is no longer traceable, so if you are B.Tiner and want more credit or your beautiful photo removed, email me and it will be done! Photo copyright 2014 B. Tiner. In the photo above you can clearly see the year 1902 in diamonds and the guilloche (the pattern of lines) Fabergé was, and still is, so famous for. Want to learn more about guilloche, click here for the wiki! See Forum Photos to see this Egg exhibited in San Francisco 2009! And below, an advertisement for the Fabergé Symposium in 2013 in Houston, USA. Above, advertisement for Fabergé Symposium 2013.